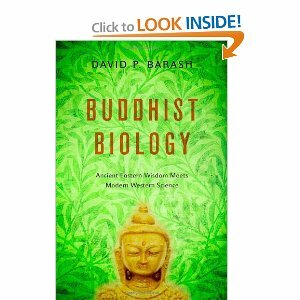 David P. Barash is an evolutionary biologist, long-time Buddhist and professor of psychology at the University of Washington, whose most recent book is Buddhist Biology: Ancient Eastern Wisdom Meets Modern Western Science, just published by Oxford University Press. Buddhism is widely seen as quietistic, self-involved, and concerned only with personal enlightenment and the achievement of inner peace. There is some truth to this characterization (especially when applied to the earliest manifestation of Buddhism), just as many scientists are concerned only with their science, refusing to become involved in messy questions of politics or policy. However, "engaged Buddhism" has grown dramatically, especially since the Vietnam War, just as environmental scientists generally have become more politically active, notably since the first Earth Day in 1970. There is a strong case to be made that the Buddha and his original followers and early intellectual/spiritual descendants were primarily concerned with individual enlightenment and helping people transcend their own, personal dukkha (“suffering,” or “disappointment”). At the same time, there is a powerful trend within what has been called “Buddhist modernism” or – a phrase I prefer, “engaged Buddhism” - that takes the basic teachings of Buddhism and derives from them a potent recipe for involvement in the world, typically on behalf of the natural environment and oppressed people. There is a story – perhaps apocryphal – in which the American avant-garde music theorist and composer, John Cage, had been asked by his friend, the abstract expressionist artist Robert Rauschenberg, whether he thought that there was too much suffering in the world. “No,” Cage supposedly replied, “I think there's just the right amount.” I must confess to a substantial helping (perhaps more than the Buddhistically appropriate “right amount”) of anger at this statement on the part of the Zen-influenced Mr. Cage. Mr. Cage was aligning himself with the Buddhist concept of “balance”; fair enough. My fear, however, is that too much balance of this sort leads to a kind of suffocating equanimity that risks degenerating into self-satisfied inaction in the face of pain and suffering. To be sure, you don’t have to be Buddhist to agree with these sentiments. It is probably no coincidence, however, that the three best known modern Buddhists are also renowned as activists and political dissidents: Thich Nhat Hanh (who settled in France, having become persona non grata in his native Vietnam for his passionate opposition to both sides during the Vietnam War), the Dalai Lama (in exile in India, having fled Tibet after the Chinese takeover) and Aung San Su Kyi (another Nobel Peace Prize winner, who lived for decades under house arrest in Burma for her embrace of democracy). Engaged Buddhism espouses many different social and political issues, nearly all of them left-leaning: Environmental protection, opposition to rampant consumerism, support for pacifism or at least anti-militarism and anti-war generally, social justice, etc. There have been exceptions, notably the enthusiasm on the part of Japanese Zen masters for that country’s prosecution of World War II. By and large, however, the convergence of engaged Buddhism with progressive – sometimes radical – politics has been almost as thorough as its convergence with biology, something I explore in my most recent book. And this, in turn, is likely due to the deep Buddhist focus on interconnectedness, which corresponds nicely to a similar concern – largely at the societal level – on the part of secular progressives. By the same token, there is no way that Ayn Rand, patron saint of right-wing individualism and apostle of selfishness, could ever have been mistaken for a Buddhist. Political liberals, progressives, and socialists, by contrast, embrace the role of a caring, connected and interdependent society as paramount, and with it, a commitment to social responsibility. Thich Nhat Hanh’s is deeply engaged on behalf of social and environmental betterment, while that of the Dalai Lama is legendary. For the American Joan Halifax, who has long been deeply involved in providing hospice and other healing services in developing countries such as India, the Buddhist approach is about “radical intimacy with the world,” which results in a “life grounded in kindness, compassion, wisdom and skillful means.” It is not simply a semantic game to point out that the Buddhist goal of becoming aware of one’s “selflessness” corresponds to the need for less “selfishness” in our behavior toward each other and toward our environment. For some people, “engaged Buddhism” is nonetheless an oxymoron, along with “environmentally sensitive Christianity,” since each requires a departure from its earliest traditions. In the case of Buddhism, however, the stretch isn’t nearly as great, since part of the Buddha’s enlightenment is said to have involved acknowledging the importance of the material world. Moreover, in its earliest texts (the so-called “Pali canon”) Buddhist doctrine includes numerous admonitions that followers should treat nature – plants, animals, rivers, mountains, even deserts and rocks – with respect and even love; i.e., with ahimsa. Nonetheless, according to originalist Buddhism, one should see through the various passionate clingings and cravings in which we and all other living things are entangled and that produce so much suffering, to transcend avid welcoming of and yearning for the things of this world, and similarly, to avoid fervent hatreds thereof, to renounce sensual pleasures and to achieve liberation from and non-attachment to the troublesome “realities” of existence. This is almost the precise opposite of engagement, as represented by not only the work of the Dalai Lama and Thich Nhat Hanh, but also a number of Western masters such as Joanna Macy and Robert Aitken. Although it can certainly be argued that the Buddha’s original teaching was concerned not so much with helping us feel more connected, but rather, less, for our purposes, this misses the point. I – and I assume, most readers of this wesbite – are less interested in unearthing the “true” and “original” teaching of the Buddha (or of anyone else), than in gaining wisdom wherever it can be found. And there is no reason to think that such wisdom is more present in truly “authentic” teachings, when such authenticity is simply a function of antiquity. Interestingly, there do not appear to be any words in Pali or Sanskrit (the two foundational languages for early Buddhist writings) that employ the word “nature” in anything approaching its modern, English usage. So we need to be careful in describing Buddhism as inherently bio-friendly or even other-friendly. Nonetheless, deep appreciation of the natural world is prominent throughout Buddhist teaching, ancient as well as recent. And according to legend, the feeling was mutual. Thus, we are told that when the Buddha gained enlightenment, sitting under a bodhi tree, he was challenged by the evil god Mara, who demanded to know by what authority he was proceeding. To this, the Buddha responded by touching the ground. And, we are told, the earth roared its approval.